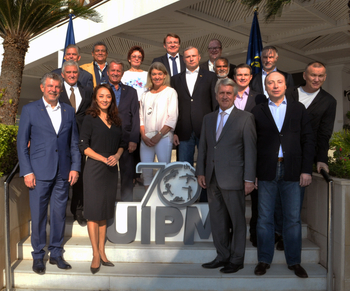 Delegates from across the global pentathlon community have gathered in Cyprus for the 70th Union Internationale de Pentathlon Moderne (UIPM) Congress. This year’s Congress – the last before the Tokyo 2020 Olympic Games – includes a gala dinner marking the 70th anniversary of UIPM, which was formed during the 1948 Olympic Games in London (GBR). The anniversary dinner on Saturday, November 10 will be attended by dignitaries including UIPM Patron HM King Constantine and Sheikh Ahmad Al-Fahad Al-Sabah, President of the Association of National Olympic Committees (ANOC). This special event, featuring the UIPM 2018 Annual Awards, will take place after the first of two days of Congress, attended this year by more than 80 nations. Now a biannual event, UIPM Congress gives National Federation delegates the opportunity to vote on a range of motions proposed by themselves and by the UIPM Executive Board (EB). Today saw the conclusion of a two-day meeting in Limassol (CYP) during which the EB reached decisions on future competitions, which will be announced during Congress. UIPM broke new ground during the meeting by becoming the first International Federation governing an Olympic sport to award the OLY title to all Olympians currently serving on the EB. 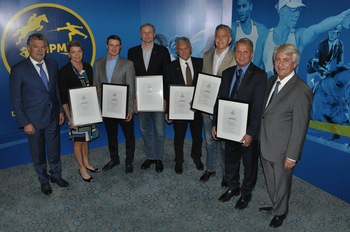 Kitty Chiller (AUS), Aya Medany (EGY), Janusz Peciak (POL), Jorge Salas (ARG), Rob Stull (USA), Dmitry Svatkovsky (RUS) and Andrejus Zadneprovskis (LTU) were the seven Olympians who received a framed OLY certificate and pin from UIPM President Dr Klaus Schormann and UIPM Vice-President Joel Bouzou (FRA), who already held the OLY title in his capacity as President of the World Olympians Association. President Dr Schormann said: "We are happy to be here in Cyprus where the UIPM Congress is being hosted for the second time. "It is a real honour for us to have some very special VIP dignitaries here to join us in celebration of 70 years of UIPM. "We have a close relationship with the leadership of the Cyprus Modern Pentathlon Federation and we are grateful to them and to the Cyprus Olympic Committee for hosting this Congress in Limassol." The 70th Anniversary Gala Dinner on November 10 will include the announcement of the winners of the 2018 UIPM Annual Awards, which recognise the best-performing athletes and coaches during the calendar year as well as celebrating excellence in competition organisation. President Dr Schormann added: "The UIPM Congress is a very strong democratic forum and many interesting motions are on the agenda this year. It will also be a pleasure to present the UIPM 2018 Annual Awards to our dedicated athletes, coaches and competition organisers."